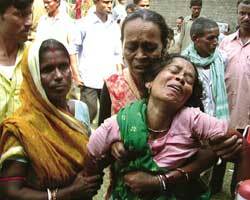 Underground mines in Jharkhand have been peppered with disasters, the most recent of which happened on September 7. An explosion ripped through the Nagdah Colliery in the Jharia area, killing 54 miners. Despite its prime coke coal content, the Jharia area is also notorious for the underground fires that have raged since 1916. In spite of the high rate of accidents in the mining industry, the safety budgets allocated by Coal India Limited and other companies are widely viewed as inadequate. "Compared to China, we are doing better. But if you look at world standards, we are nowhere close. Our mines largely continue to be very poor," says Gurdeep Singh, professor, Indian School of Mines (ism), Dhanbad. Five hundred sixty three lives were lost in mining accidents in 2003 and 599 in 2004. Although the figure dropped to 340 in 2005, mining conditions have not necessarily improved. Transformation of mines from manual labour to mechanisation is held as a way of making mines safer, along with using online monitoring systems and planning and improving mine conditions. "The recent disaster could have been averted if the emergency team had reached on time or if the mine had an online gas monitoring system," says Singh. Online monitoring systems relay real-time information on the levels of dangerous gases in mines to the control room. The Nagdah tragedy also occurred because of high levels of methane, one of the most dangerous gases in an underground mine. The issue of mechanisation of mines has implications for livelihood as well. "The mechanisation of mines, although ensures higher production, frequently gets blocked due to political reasons, raised for livelihood concerns," says Singh. Coal India alone employs over 600,000 people. Singareni has converted 31 out of its 47 underground mines to mechanised mines. "Coal India is caught in a vicious circle. About four years back, Coal India focused on open-cast mines for less cost and higher production. But most of our coal deposits can be accessed only through underground systems. Over time, production waned for Coal India and losses increased, and they started shifting to underground. But due to losses, their input costs also decreased and of course safety is always the first one to reduce. When that happens, of course, safety gets compromised," says D C Panigrahi, professor, ism. Most of the Indian coal sector is held by the government through Coal India Limited and Singareni Collieries. Coal India produces about 340 million tonnes of coal annually and Singareni Collieries produces about 36 million tonnes. The budget for safety also varies. Coal India has allocated Rs 590 crore as the safety budget outlay for 2006, while Singareni has allocated Rs 330.9 crore. Even with such inadequate budget outlays, Coal India has utilised only half of their safety fund in the past two years. Moreover, mines in India reach a depth up to a kilometre. At such depths, working conditions are dangerous. According to Panigrahi, investing in the improvement of conditions will improve safety and increase productivity of the miners. "Unfortunately, Indian mining companies do not see safety investment as a precursor to increased production. But these two are invariably linked," he added.